From left to right: Jesse Hagopian (co-editor of Teaching for Black Lives), Michael Bennett, Macklemore [Photo Credit: Ben Secord]. Teaching for Black Lives is a collection of teaching activities, role-plays, essays, poems and art designed to help educators humanize Black people in the curriculum. The book demonstrates how teachers can connect the curriculum to young people’s lives and explore how classrooms and schools can be set up either to reproduce racism or challenge it. This wide distribution of Teaching for Black Lives comes at an ideal time to help support Seattle Public Schools’ ethnic studies initiative. Last year SPS convened an ethnic studies taskforce which helped coordinate the piloting of ethnic studies curriculum at fifteen schools—including educators who used materials from Teaching for Black Lives. Additionally, thousands of Seattle educators have participated in the “Black Lives Matter at School” initiative over the past two years demonstrating the tremendous desire of educators to deepen the discussions in the classroom about race and equity. Teaching for Black Lives was produced by the non-profit publisher Rethinking Schools, which also publishes a quarterly magazine for educators. The book’s editors are Dr. Dyan Watson, Jesse Hagopian and Dr. Wayne Au. Dr. Watson is an editor for Rethinking Schools and the social studies coordinator for the secondary program in teacher education at Lewis & Clark College in Portland, Oregon. 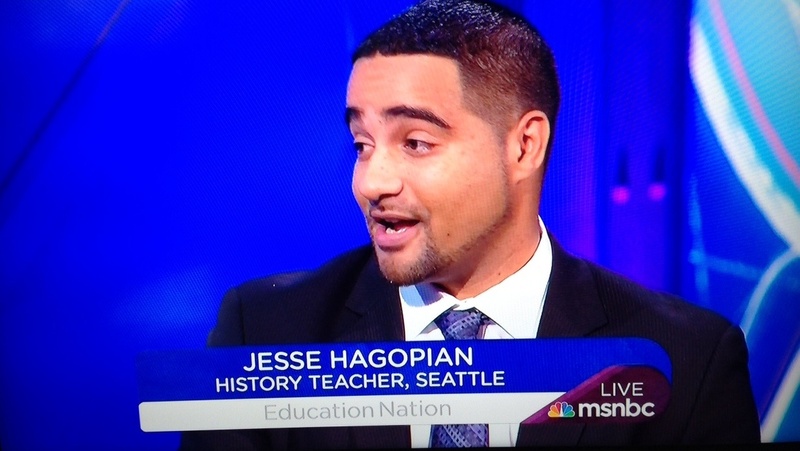 Jesse Hagopian is an award winning Ethnic Studies teacher at Seattle’s Garfield High School, an editor for Rethinking Schools, and is the director of the Black Education Matters Award. Dr. Au is an editor for Rethinking Schools, a renowned author of many books on education, and a professor in the School of Educational Studies at the University of Washington, Bothell campus where he also serves as the Dean of Diversity and Equity. YES! What a way to truly affect the future. Yay! Yet another reason to love Michael Bennett. I would love to get a copy. How do I go about it? Yes, how do we get the book?!! Educators at Seattle World School would like copies of this book. I would love several copies. Where can we purchase some?